Eye appeal. Beauty is in the eye of the beholder, but some paintings are not appealing to most people. Those that lack eye appeal are difficult to sell and do not wear well. Although it takes experience to recognize them, if you buy something you really like and not for the name, chances are you’ll avoid this pitfall. Subject matter. When considering representational works of art, some subjects are difficult to live with – human skulls, for example – unless possibly done by Charles Russell or Georgia O’Keeffe. Dead animals and dead humans are in the same category. Period. Period refers to the time a work was created. 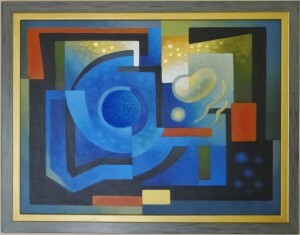 Almost every artist has his early period, his mature period, his late period, his abstract period, etc. Early works are generally less valuable than later works, but there are many exceptions. Medium. A new collector may inquire as to the date a work was done, and at the same time might ask about the medium, whether oil print, watercolor, charcoal, clay, pastel, acrylic or something else. Value is in part based on medium. A artist’s oils, for example, are generally valued more highly than his pastels or prints, and works with color are more desirable than black and white, in general. Signature. Signature on our list refers to whether a work is signed or not. There is nothing wrong with buying an unsigned work; however, pay less for it because, in the scheme of things, it is worth less without the painter’s hand signature. Original prints are usually signed in the plate and handsigned. If the print you are buying is signed in the plate only, it is worth less than if it were handsigned.